In the immediate aftermath of the Pearl Harbor attacks - on December 7, 1941 - the U.S. government used the small island of Kahoolawe - off the shore of Maui - for training purposes. Expecting the war in the Pacific to be brutal, as Allied forces attempted to wrest captured islands from Japan, military leaders wanted to be sure that American forces were ready for extremely difficult combat conditions. Kahoolawe seemed the perfect choice. Even after World War II was over, the U.S. military used Kahoolawe for weapons-testing. "Operation Sailor Hat," for example, took place on February 6, 1965 when the Navy set-off three test explosions at the tip of the island. The first shot - "Bravo" - was a 500-ton TNT explosive charge which sent a shock wave across the water and a shock-condensation cloud overhead. A nearby ship, USS Atlanta (IX-304) monitored the events. All of these events, however, were extremely troubling to Hawaiians who viewed the land as an important part of their cultural heritage. Even though the island is small - measuring 11 miles in length and 6 miles in width - it contains hundreds of recorded archaeological or historic sites. In 1990, President George H.W. 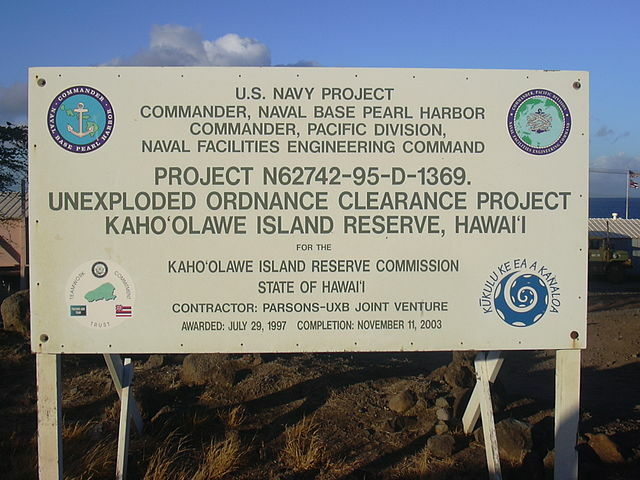 Bush ordered the U.S. military to stop using the island and locate unexploded ordnance. Now controlled by the State of Hawaii, Kahoolawe is being cleaned-up and restored. To learn more about it - and to hear the Hawaiian language in song - follow the link to the restoration-information site. Aerial view of Kahoolawe - with Maui in the distance, including the dormant volcano Haleakala rising above the clouds - by Travis.Thurston, online courtesy Wikimedia Commons. Bos, Carole "Kahoolawe - The Target Island" AwesomeStories.com. Oct 07, 2013. Apr 19, 2019.